CD ripper for when you have many discs to rip. Is there a better alternative to CD Stack? Is CD Stack really the best app in MP3 category? Will CD Stack work good on macOS 10.13.4? 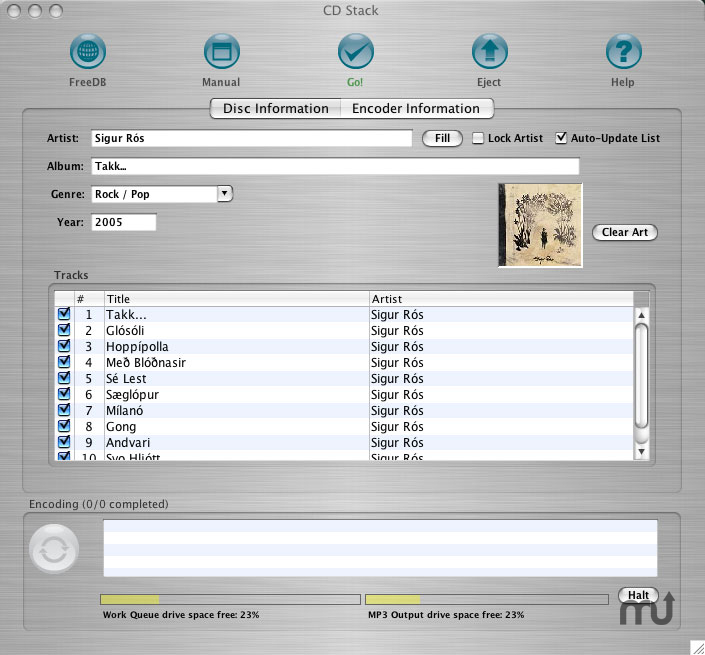 CD Stack allows you to rip your CDs with control that you may not be used to on a Mac. It is designed with many shortcuts in mind for when you have a large amount of discs to rip. You add cover art when you rip, control with finer detail how you want your MP3s encoded, and use the best encoder out there, the L.A.M.E. encoding engine. Version 1.1.2: Fixed bug for users using Mac OS X Leopard 10.5.1 that made pop-up windows not display properly. 5 MB Free Hard Drive Space on installation drive, plus enough space to hold your MP3 files, and temporary CD ripping files. CD Stack needs a rating. Be the first to rate this app and get the discussion started! When you rip with CD Stack, the CD-ROM drive will rip as fast as it can, and MP3 encoding happens as fast as it can. The encoding speed, however, will not affect how fast you can get through your discs. If you have a fast or upgraded CD/DVD-ROM drive, you will be able to rip your CDs a lot faster, leaving the computer to finish encoding your MP3s as fast as it can. This means less time babysitting the computer while it simultaneously rips and encodes. Integrates with iTunes. Or Not. CD Stack will automatically import songs that you ripped into iTunes, complete with artist and track information and cover art. You also have the option of not importing into iTunes, if you would rather use a different program to play back your MP3s. CD Stack allows you to organize the MP3 files by different criteria so that you can organize your files out exactly as you like. It's definitely NOT lame... But it is, (in our opinion) the best MP3 encoder out there. Your files will sound better, and you will have more control over bitrate and quality than you would with other software. Also, unlike other software that uses L.A.M.E. for the Mac, CD Stack does not require you to use iTunes. It completely stands alone.